Some photos on this page are courtesy of Alexander Shanin, Moscow, and are used with author's permission. This tram station was opened in 1954. 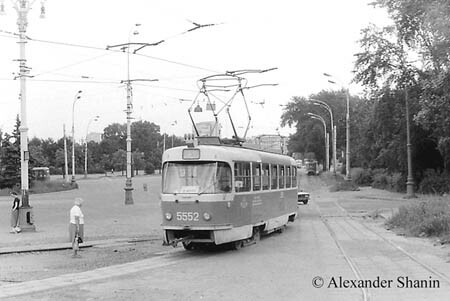 That year the All-Union Exhibition (VDNKh) was reopened, and a reliable transport was required - the only transport to fulfil the requirements being the tram. 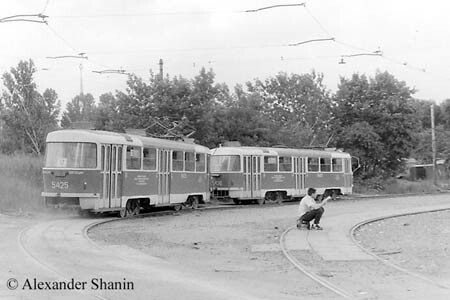 In fact, there were two tram stations - South and North - near the exhibition entrance. After years, the Metro came hither, and the tram stations lost most of patronage. The North station was closed in 1972, and the South one survived until 1997. A tram is entering the terminus. Note that the left track branches, and the right track returns back to Prospekt Mira. Almost the same place, but viewed in the opposite direction. 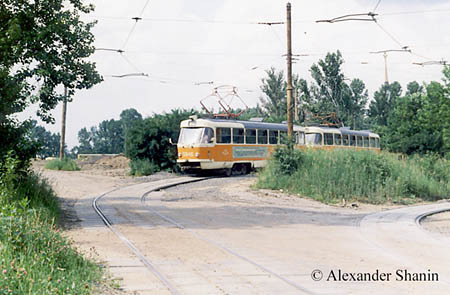 The terminus had two tracks, but in 1980's only the inner track was used by trams. The outer track mostly served as a parking lot for road maintenance vehicles - snowploughs etc. By the end of 1980's, those vehicles were rebased from the track, but it was not put in regular use anyway. The terminus had two junctions connecting the inner and outer tracks. 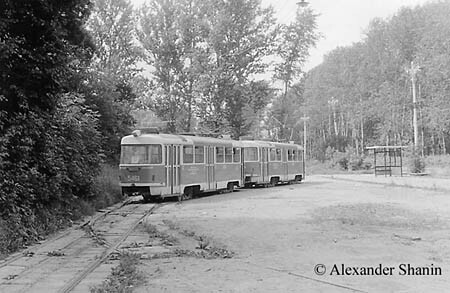 A set of two Tatras is moving along one of those branches, while the other one (obviously disused) looms in the foreground. The train is leaving the terminus. The departure track sloped up and down a small hill, just look at the level difference between the tracks. 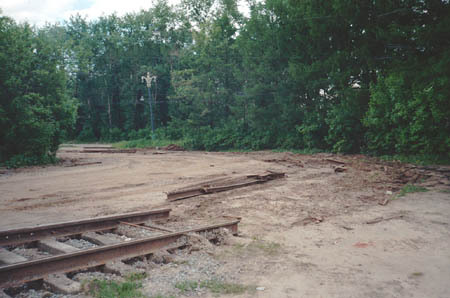 The tracks were completely rebuilt in 1995. The future seemed bright for the terminus, but... Somebody in the city government changed his mind, and in 1997 the loop was closed, and the tracks were taken away. A new supermarked has been built here instead. 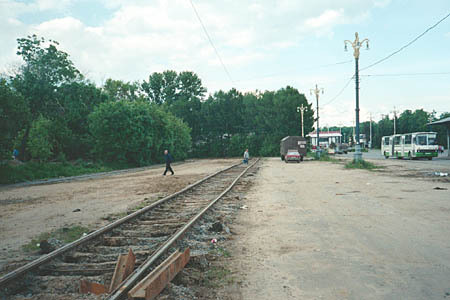 The rails were partly dismantled in July 1997. A year later nothing would remind of them. 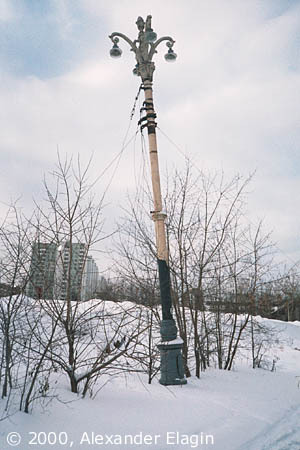 Some pieces of overhead wire still can be seen in the back yard of the supermarket built in the place where the tracks had been.